It’s the taste of the Australian summer in our iconic stubby bottle. Real coconut water and pineapple juice blended and brewed for two full days to create a taste guaranteed to transport you to the tropics. Enjoy chilled, straight from the bottle, poured over ice, or get mixing to create cocktails that turns every backyard into a slice of paradise. 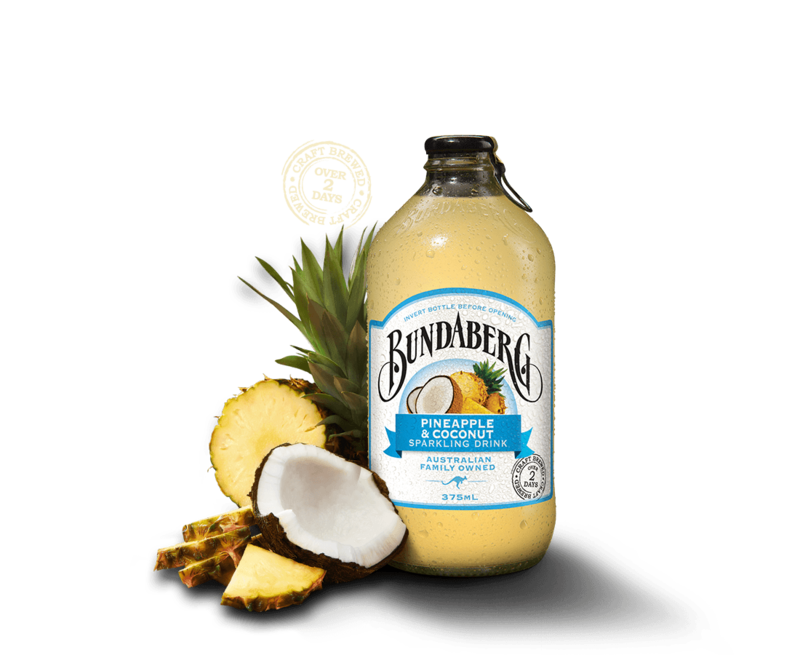 Mixed with a little lime juice, some fresh cream and coconut water, Bundaberg Pineapple & Coconut makes a dreamy Pina Colada. Pour into the fanciest glass you can find, garnish with a pineapple leaf then pop a frangipani flower behind your ear and relax. Ingredients: Carbonated water, cane sugar, pineapple juice from concentrate (7%), pineapple brew (water, pineapple juice concentrate, sugar, nettle leaf, yeast), coconut water (1%), acid (citric acid), flavours, preservatives (211, 202), thickener (pectin), antioxidant (aacorbic acid), colour (160a).